Over 100 Black Swarovski Pearls and Permanent Finish Silver Seed Bead netted bracelet with button loop and clasp. Stunning Emerald Swarovski Crystals (Over 100) finished with Gold beaded netting. 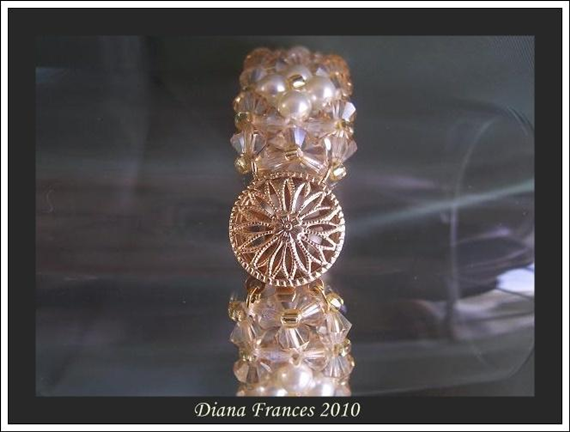 Featuring pieces of Mother of Pearl stitched on to monfilament cord with Swarovski Pearls and Crystals. Loop Closure for comfort. 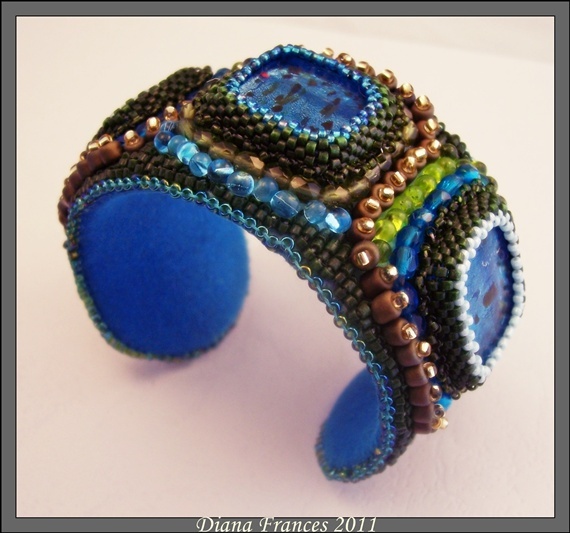 This is the first cuff I have ever made and I love it. 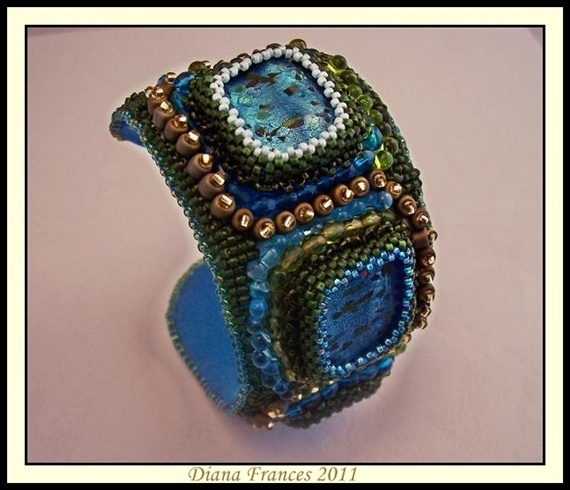 I had the aqua coloured tile beads for a few years and always knew I would make a cuff with them. Last school holidays we took the girls to our favourite beach about an hour north of Auckland where we usualy camp over the summer. July here is winter so we hired a small cabin for 3days. 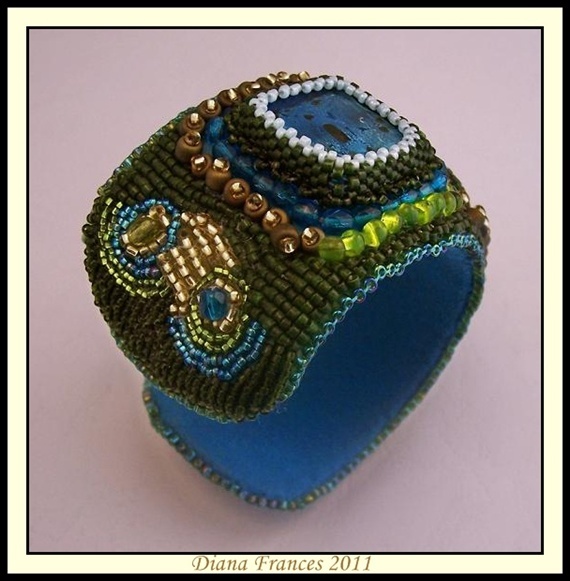 I took all the materials with me to begin this cuff, so it is ironic that it has turned out "Ocean like" since it was at the beach that I took a long time deciding on eventual colours. They actually kind of evolved as did the pattern. 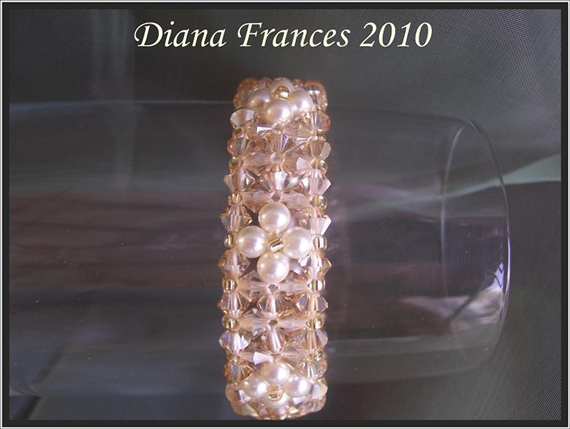 Simply stunning bracelet woven with Swarovski Pearls in Light Gold and Siam and Clear Swarovski Crystals. Also uses highest quality Japanese Seed Beads. Finished with a 14kt Gold Filled Box Clasp for comfort.